To see SCHOOLS INITIATIVE DOCUMENTS, click on the link. 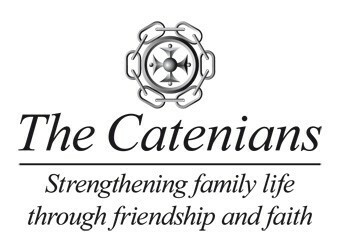 Senior provincial and national members of The Catenian Association have enthusiastically endorsed our joint initiative with Solihull Circle to support Catholic Youth by putting together panels of Catenians and other interested Catholics with diverse backgrounds in Industry, Commerce and Public Service who will run Practice Job Interviews and Employability Workshops in local Catholic Secondary Schools for 4th (Y11), 5th (Y12) and 6th Form (Y13) Pupils. To date (as of January 2016) we’ve interviewed, trained and/or briefed more than 150 teenagers in two local schools….! We put together two panels with 8 Brothers (plus one Brother’s wife and a non-Catenian Catholic lady) from North Warwickshire and Solihull Circles, supported by 4 other non-Catenian Catholic volunteers. All but one of our volunteers have CRB clearance for working with vulnerable young people. After discussions with St Peter’s Catholic Secondary School, we held 19 “general” interviews with 4th formers (Y11) (assessing them for a notional job) and then a further 11 “specialist” (University and Medical School entrance practice) interviews with 6th formers in July 2014. St Peter’s School greatly appreciated our help, and asked us to continue to support them with our Interview Programme in the 2015/16 School Year. 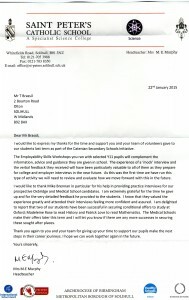 The “Thank You” letter from the current Head Teacher of St Peter’s may be seen below. The pictures below show some of St Peter’s past 6th Formers. (2) The Workshop’s content included writing an Application Letter, researching Employers, and analysing Job Adverts, with advice & help available on real applications. (3) Finally, the Workshops provided advice on Preparing for Interviews, important Do’s and Don’ts, preparing answers to popular interview questions, and the importance of both attitude and body language. 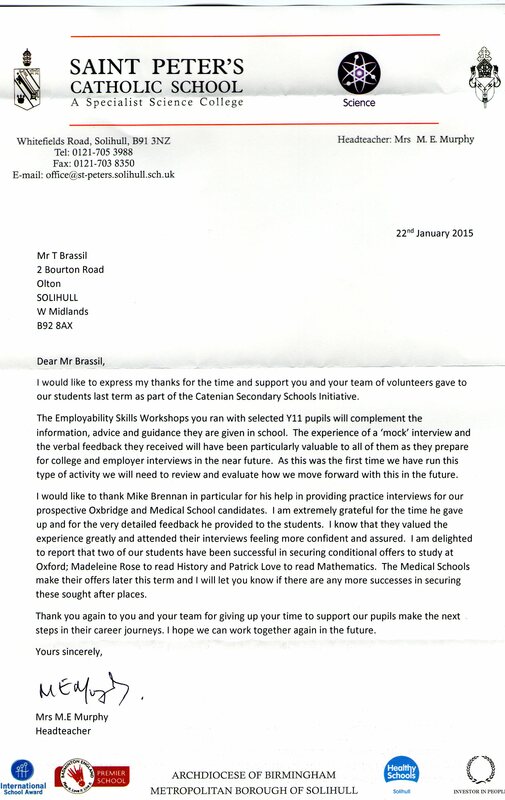 Pupils who attended the workshops had a 25 minute Practice Job Interview, with 5 minutes of verbal feedback at the end. These workshops generally had 2 Volunteers (depending on the amount of personal help anticipated) and catered for an average of 8 pupils per one hour school period, helping upto 40 pupils per school day. To minimise disruption to the School, our Team was only there for 2 days/week. We found the biggest challenge was to get the 4th year pupils to attend the (non-compulsory) Workshops, those who did attend were generally attentive, cooperative and appreciative, and (surprisingly!) this including those with known disciplinary problems or Special Educational Needs (perhaps 30%). These activities were scheduled throughout the Autumn Term, to ease both our Volunteer scheduling and to improve the school’s flexibility. In November 2014 we started helping Archbishop Ilsley Catholic School in Acock’s Green, and worked with the Head and his senior team to devise a programme to address the needs of their pupils, who are from a much more diverse socio-economic mix than at St Peter’s in Solihull. We successfully delivered a compressed (only 1 hour) version of our Employability Workshops, plus about fifty x 6th form Interviews, including several MedSchool and Oxbridge Entrance Practice Interviews. The kids were very impressive and genuinely seemed to appreciate our help. We hope this initiative will become Province-wide, and eventually spread across the Association, addressing Catholic Schools throughout the UK and beyond. Any Catenian Circle (or Catholic School) is welcome to download and use the comprehensive materials in our SCHOOLS INITIATIVE DOCUMENTS and we will be pleased to help them with practical guidance & advice wherever possible. For genuine help, contact tgbrassil@aol.com or ring me on 0121 706 2118 (home) or 01783 921 749 (mobile). Michael Gach, a former St G&T pupil, is currently a 2nd year Medical School student at Lincoln College, Oxford. (Michael is not a Catenian but offered to help.) (DBS Cleared). Michael can run a very practical “Applying to Med School” briefing seminar for selected pupils on request. If any other Brother (or better still, a female family member or friend) who has experience of recruitment interviewing and would like to help with this initiative, please contact the CSSI Organiser, Tom Brassil on tgbrassil@aol.com or 0121 706 2118 (home) or 07803 921 749 (mobile). We actually prefer that Volunteers are NOT teachers, as schools say they have many of these – they prefer experienced people from other professions as there’s a better chance that the pupils will listen and take note of what they say. The likely time commitment per volunteer is estimated at somewhere between 5 and 15 hours each month. Obviously, more volunteers would help to spread the load. There is a substantial untapped demand for this free service. We’re currently only addressing 2 schools (out of a total of 4 schools in our immediate “catchment area”), and having spoken to many School Governors, we know the others would also like to be included in the programme in future. This is a “win-win” initiative. We use our skills & experience to help meet the Association’s objective of encouraging Catholic Youth, establish valuable links with Catholic Schools, make The Catenians better known and (of course) the parents of 15 to 18 year olds are likely to be between 35 and 45 years old, which is our key recruitment target age group for new members. IF YOU HAVE AN OPINION ON OR AN IDEA TO HELP WITH THIS INITIATIVE THEN PLEASE LEAVE A COMMENT BELOW !